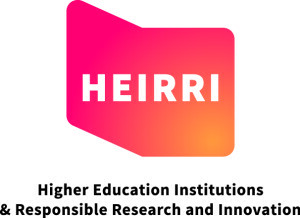 The Institute for Advanced Studies (Institut für Höhere Studien, IHS) developed a modular curriculum as part of the European project HEIRRI: Higher Education Institutions & Responsible Research and Innovation. The project aims to integrate the concept of “Responsible Research and Innovation”, or RRI, focusing on universities and other higher education institutions (HEI). The concept of “Responsible Research and Innovation” implies the alignment of R+D+i, in all its phases, with the needs, values and expectations of society. The European Commission is very actively fostering the knowledge and practical implementation of RRI, focusing its actions on 6 key axes: public engagement; science ethics; science education; gender equality; open access; and science governance. The HEIRRI project is one of the first initiatives that Horizon 2020 sets in motion in order to integrate RRI in university education. Its aim is to ensure that future science and engineering professionals (and from other related fields) incorporate RRI in their activity. The project received funding from the European Union’s Horizon 2020 research and innovation programme. Lauder Business School will, as part of the International Business Administration program, offer several modules teaching RRI to students. The course is taught by Prof. Dr. Robert Braun, who is also Senior Researcher at the Techno Science and Societal Transformation research group in IHS. The course will be the first HEI course dedicated specifically to RRI in Austria.